The Quaker parrot is a small-sized parrot about the size of a cockatiel with a heavier structure. These bright green monomorphic birds are found in the sub-tropical regions of South America. Color Green upper plumage, grayish breast, patches of gray on feathers, olive yellow upper abdomen, yellowish-green rump, abdomen and thighs, brownish-orange beak, patches of blue on its green tail. Habitat Subtropical woodlands, but gets along well in urban areas. 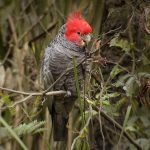 The first three are found around the Paraguay region whereas the fourth subspecies can be found at higher altitudes in parts of Bolivia. 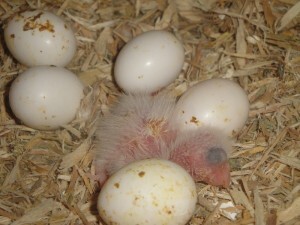 It is also smaller in size, having a brighter body color. 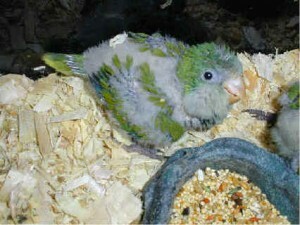 The different color mutations of this species include blue, lutino, fallow, pallid, cinnamon grey-green, opaline, and violet. 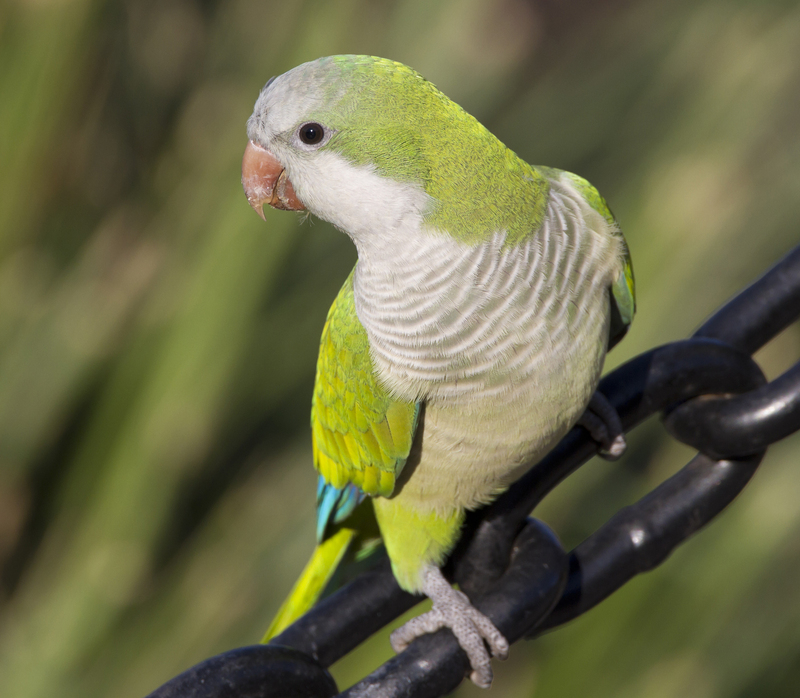 These intelligent, gregarious birds are a perfect source of amusement for their owners. 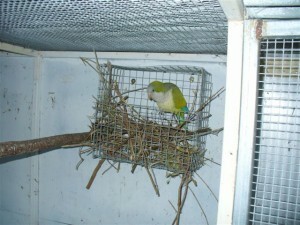 Owners should be cautious while choosing a cage as these birds are adept at finding ways to open their cage locks. 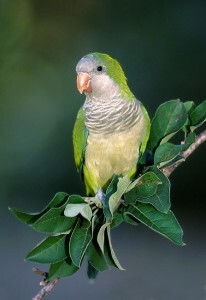 Their cage should be large and spacious, coupled with wooden or natural perches so they can fly about from branch to branch. Because of their tendency to escape, the bars should be spaced at a distance of five-eighth of an inch. Cage doors of stainless steel, opening sideways are best-suited as the ones made from guillotine may leave them injured while attempting to unhinge it. Highly fascinated by toys, any newly included objects in their dwelling catch their attention at an instant. 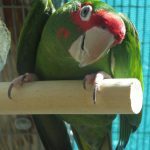 Therefore, it would be a good idea to decorate the cage with different chewable bird toys of varied shapes, size, color, and purpose. Try bringing in new toys at frequent intervals to prevent them from getting bored with the same stuff. You can also place swings and ladders in the cage. 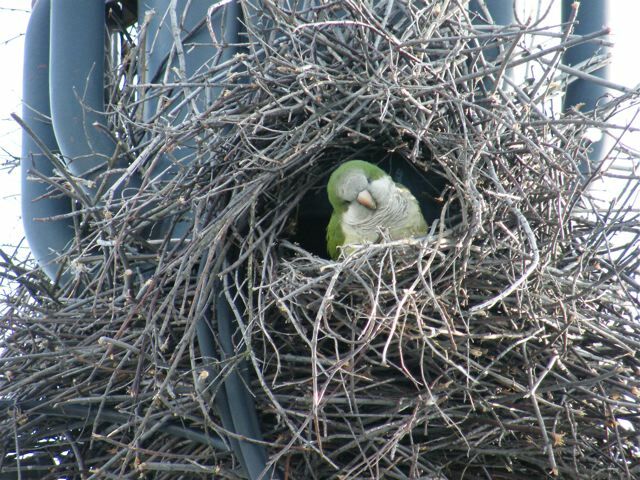 They are the only species of the parrot family to build their nests with sticks. In fact, some of them are even fond of making nests with anything they get in hand like pencils, toothpicks, shredded paper and so on. 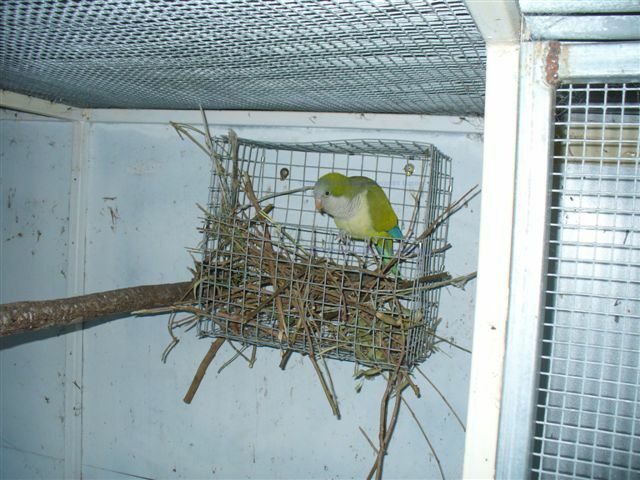 While choosing nest boxes for these birds make sure you have some of their favorite nesting materials handy which is safe for them. These hardy birds will do well when kept at an average room temperature, which should not exceed 80°F. Refrain from keeping your bird’s cage near the kitchen as fumes of cooking may be harmful to them. 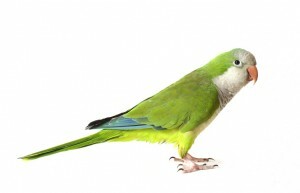 Though they can withstand cold, avoid drafts from air conditioners, especially while bathing your parakeet. 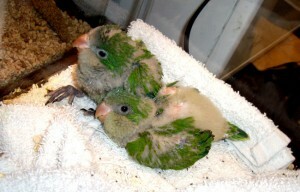 Clean the cage along with the substrates on a regular basis. Bathing or misting your parrot regularly with fresh chlorine-free water will help in removing dirt. Trim your bird’s nails to avoid any injuries. You may also take it to a vet or professional groomer for this purpose. Owners also prefer clipping their wings to prevent them from escaping or flying around in a destructive way. Give your pet a healthy diet of seed mix, nuts, legumes, pellets and grains. Introduce a variety of fresh vegetables such as carrots, beans, cucumber, kale and lettuce as well as healthy fruits like orange, mango, pears, apple and banana. Pumpkin and sunflower seeds are to be occasionally given, only as special treats, as both are high in fat. Excessive eating may make them overweight causing a liver problem and hypertension. Therefore try giving them a diet low in salt and saturated fats. Provide fresh water on a regular basis. 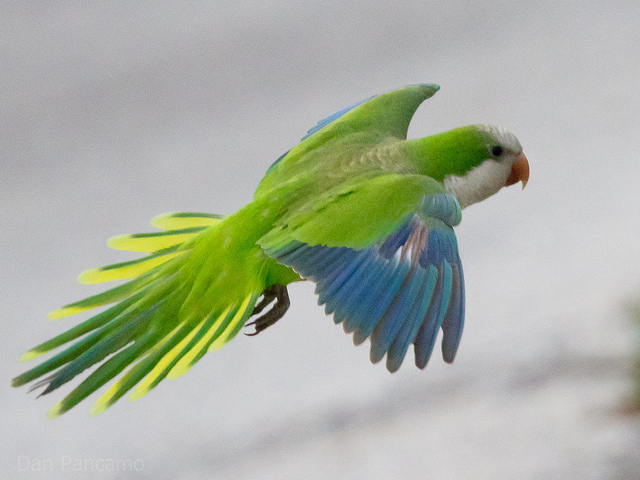 These talking parakeets can pick up many phrases, words as well as complicated vocabularies. 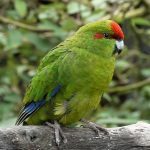 They are known to chirp about noisily among themselves. Therefore, if you are a peace-loving person or live in a quiet neighborhood, this bird is not the correct choice for you. 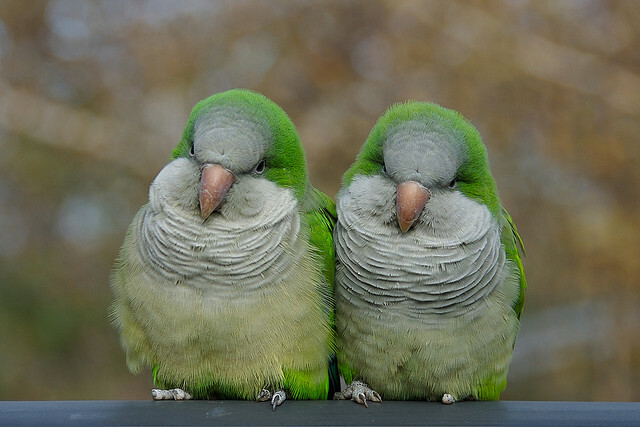 These sociable birds can be a trainer’s delight when groomed tactfully. Being active, inquisitive, mischievous and playful, they bond well with their owners. Leaving them unattended frequently may cause depression, leading to destructive and aggressive behavior. 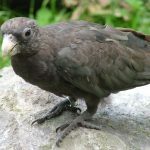 Because of their territorial nature, it is advisable not to keep other birds along with them unless well socialized as they may go to the extent of killing the uninvited visitor. Having sharp brains, it responds to training well. Play some soft, soothing music in front of it to keep it calm and entertained. 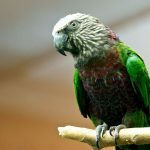 Spend a lot of time in front of your talking quaker parrot’s cage, interacting with it by just picking up a simple conversation. 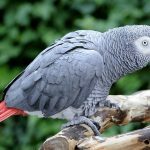 After you feel that your bird has developed closeness with you, give it some time outside its cage by arranging a play gym or anything else to make it feel entertained. You may even teach your pet Monk to climb to your hand along with other interesting tricks. If you are not around, then keep your quaker inside the cage as it may fly inside drawers or closets or even pick or chew anything available. They tend to suffer from the problem of fatty liver, mostly when they have an improper diet. Moreover, intense destructive behavior can cause them to pluck their feather that may reach the extent of self-mutilation, affecting the physical and mental health of these parakeets. They are known to be carriers of psittacosis, which affects their immune system, also causing a respiratory problem. Other problems suffered by them include papilloma, gout, and pox. 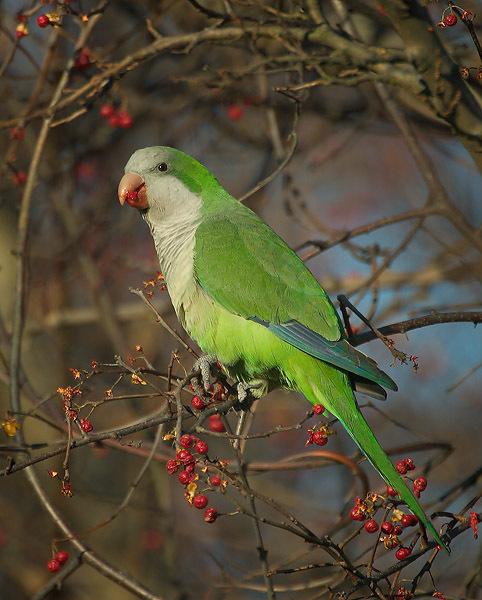 Quaker parrots are considered to be a threat to agriculture, which is one of the reasons for its ownership being illegal in many states of USA. They are named “Quaker” because of the manner in which they quake or shake their head. 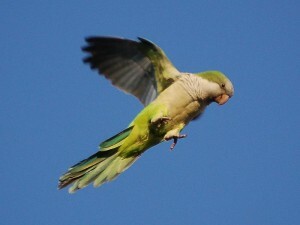 Some are also of the view that the grayish pattern on their face resembles the Quaker outfit. 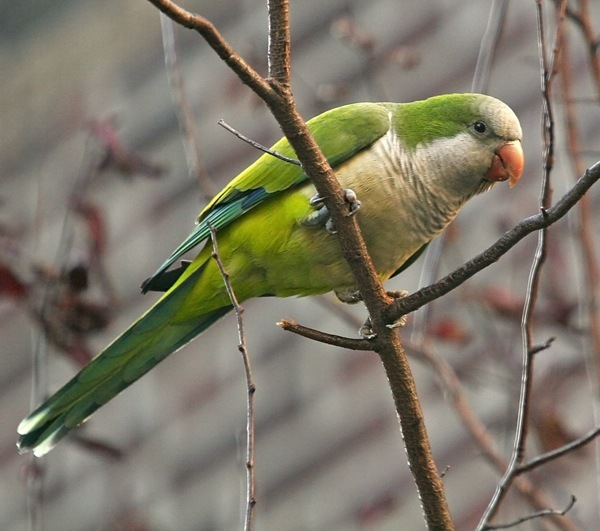 This bird is also called monk parakeet as it has pale-colored feathers on top of its head resembling a tonsure of a monk. 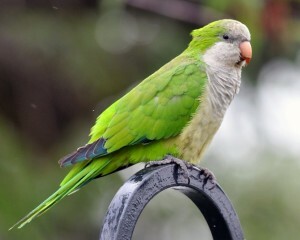 4 Responses to "Quaker Parrot (Monk Parakeet)"
Hi, Deanna, sorry we can’t help you in this regard as we do not sell birds. 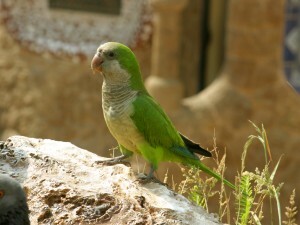 Looking to purchase a monk parrot. 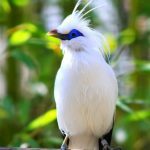 Hi, Marilyn, we do not sell birds, but if you need any information regarding any specific bird species to pet, check out our website in detail. We will be glad to help you.